Co-Directors: Gregory P. Kalemkerian, M.D., & Mark B. Orringer, M.D. Gregory P. Kalemkerian, M.D Mark B. Orringer, M.D. The Thoracic Oncology Program at the University of Michigan focuses on the care of patients with intrathoracic cancers - including esophageal cancer, small cell and non-small cell lung cancer, thymic malignancies and mesothelioma - as well as research aimed at developing more effective therapy for these diseases. The program is staffed by thoracic surgeons, medical and radiation oncologists, pulmonologists, gastroenterologists, radiologists, pathologists, physician assistants and nurses dedicated to providing patients with the best possible care. Members participate in the weekly Multidisciplinary Lung Cancer Clinic and meet weekly in the Multidisciplinary Thoracic Oncology Conference. A variety of clinical trials are available, ranging from chemoprevention studies to the evaluation of state-of-the-art investigational therapies. The team's expertise with emerging technologies, including video-assisted thoracoscopic surgery, stereotactic radiosurgery, photodynamic therapy, esophageal and airway stenting, ultrasound-guided transbronchial/transesophageal biopsy, and radiofrequency ablation, allows for less invasive options in the diagnosis and care of patients with thoracic cancers. For patients with esophageal cancer, transhiatal esophagectomy without thoracotomy was pioneered and refined at the University of Michigan by Mark Orringer, M.D. More than 2,000 patients have undergone this operation at the U-M in the past 30 years, giving U-M physicians the most experience with this procedure in the United States. The Thoracic Oncology Program is also a leader in the development of combined modality therapy for esophageal cancer, a therapy in which patients are treated with chemotherapy, radiotherapy and surgery in an attempt to improve their chances for survival. For patients with lung cancer, optimal treatment usually requires the integration of multiple therapeutic modalities, including surgery, chemotherapy and radiation therapy. The U-M Thoracic Oncology team consists of experts in each of these disciplines who focus extensively on the care of patients with lung cancer and who meet regularly to determine the best management strategy for each individual patient. The U-M Thoracic Oncology Program has also developed and participated in numerous clinical trials for patients with all stages of small cell and non-small cell lung cancer to evaluate novel therapeutic strategies using leading-edge chemotherapy agents and radiotherapy techniques. There are three main components within the UMCCC Thoracic Oncology Program, Basic Laboratory/Translational Research, Clinical Research, and Clinical Care. Activities include basic laboratory research aimed at understanding the molecular mechanisms responsible for the development and progression of lung and esophageal cancer, as well as translational studies that bridge the lab and the clinic by utilizing tumor tissue and clinical information from our patients to develop novel, more effective strategies to treat lung cancer. 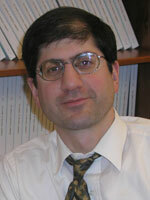 Dr. David Beer is the leader of this component of the Program. His work on the molecular genetics and genomic profiling of lung and esophageal cancer is nationally prominent and has great potential to impact the way lung cancer is treated in the future. The basic/translational arm of the Thoracic Oncology Program also includes Doug Arenberg and Venkat Keshamouni in Pulmonary Medicine, Andrew Chang in Thoracic Surgery, and David Reisman and Khaled Hassan in Medical Oncology, who are pursuing promising research that could benefit from philanthropic support. Dr. David Beer and colleagues have collected hundreds of specimens from lung and esophageal cancer patients who have undergone surgery at the University of Michigan over the past 15 years. Dr. Beer has used these tumor samples to identify numerous genetic abnormalities that are involved in the progression of these diseases and may serve as targets for novel therapy. In addition, he has performed large-scale gene surveys on tumors from patients with early-stage lung cancer and identified a panel of genes that can predict a patient's ultimate outcome (genomic profiling). He is now working with colleagues throughout the country to refine this technique into a method that will be tested in clinical trials. Such tests that can predict patient survival can be very useful to tailor treatment specifically to an individual, treating those who need therapy and avoiding further treatment in those who may already be cured by surgery alone. Dr. Douglas Arenberg and colleagues have been studying the mechanisms through which new blood vessels develop and grow in lung cancers (angiogenesis). Without such new blood vessel growth, cancerous tumors could not grow and could not spread throughout the body. Dr. Arenberg has identified several natural molecules (chemokines) that regulate blood vessel formation in lung cancers. These molecules are primarily produced either by cancer cells or by other cells within the tumor. Dr. Arenberg is now studying how certain types of inflammatory cells within lung cancers can affect the growth of blood vessels and the role that these cells and the chemicals that they produce play in the progression and spread of human lung cancer. This work holds promise for identifying new methods of inhibiting these processes that can be translated into the clinic with the ultimate goal of improving the outcome of people with lung cancer. Dr. Khaled Hassan is working with Drs. Max Wicha and Greg Kalemkerian to identify and characterize stem cells within human lung tumors. Such stem cells are believed to be the cause of the resistance that allows many cancers to survive our currently available treatments. Dr. Wicha has previously identified such cells in human breast cancers and has been defining the molecular pathways that keep these stem cells alive despite our attempts to kill them with chemotherapy and radiation therapy. Dr. Hassan is also evaluating the effects of several drugs that can target certain molecular pathways that appear to be involved in stem cell growth and survival in an effort to develop more effective treatment for lung cancer. The Thoracic Oncology Program has active investigator-initiated, institutional efforts underway in Medical Oncology and Radiation Oncology. These trials have been developed by clinical researchers at U-M and aim to evaluate novel strategies for the treatment of lung and esophageal cancer in our patients. The members of the Program also participate in larger multi-institutional cooperative group clinical trials. Priority funding needs in this area are a dedicated Research Nurse and Clinical Research Coordinator to facilitate enrollment of patients on to clinical trials, the care of patients on the trials, and the timely regulatory oversight of the trials. Drs. Spring Kong, James Hayman and colleagues have performed a series of clinical trials over the past 15 years to study the utility of high-dose radiation therapy in patients with lung cancer. They have shown that such treatment is safe and feasible, and that patient survival appears to be improved with dose escalation. This approach is being refined by adapting the radiation treatment field based on serial positron emission tomography (PET) scans obtained before and during radiation treatment. By doing so, it is hoped to be able to increase the radiation dose even further while limiting the size of the treated field. In addition, methods of treating patients with chemotherapy along with radiation to maximize cancer cell killing is being evaluated. The goal of these studies is to improve patient survival even further while minimizing the potential side-effects of high-dose radiation. Drs. Bryan Schneider and Greg Kalemkerian have developed and initiated a clinical trial evaluating the use of sunitinib (Sutent), a drug that inhibits blood vessel formation in tumors, in patients with small cell lung cancer. Sunitinib has been approved by the FDA for use in patients with kidney cancer, but has yet to be studied in small cell lung cancer. Patients with advanced small cell lung cancer usually have good shrinkage of their tumors with initial chemotherapy, but the cancer inevitably recurs in a more resistant form and is fatal within months of recurrence. The goal of the study is to determine if treatment with sunitinib after chemotherapy can improve survival in patients who have had shrinkage of their cancer with initial standard chemotherapy. Dr. Nithya Ramnath has developed and initiated a clinical trial to evaluate the addition of high-dose, intravenous vitamin D to standard chemotherapy for patients with advanced non-small cell lung cancer. Vitamin D has many effects on the pathways that regulate cell growth and proliferation in both normal and cancer cells. Laboratory studies have suggested that vitamin D can enhance the anti-cancer activity of chemotherapy drugs and this trial aims to test this approach in patients with lung cancer. For many years now, lung cancer patients at U-M have been cared for by a comprehensive group of clinicians in multiple medical disciplines with extensive experience and expertise in the care of such patients. There is a long-standing coordination of care through the UMCCC Multidisciplinary Thoracic Oncology Conference. Recently initiated is a Multidisciplinary Lung Cancer Clinic that allows thoracic surgeons, medical oncologists, radiation oncologists, pulmonary medicine experts, and oncologic psychologists to see patients all in one place at one time in the Cancer Center. This allows the provision of efficient and comprehensive care to meet the needs of our patients with known or suspected lung cancer. The activities of this clinic are coordinated by a dedicated Lung Cancer Clinic Coordinator in order to ensure timely evaluation of all of our newly referred patients. As we've learned, quitting smoking will save lives, but it will not end or cure lung cancer. The key is research. While lung cancer causes one in three cancer deaths, the National Cancer Institute (NCI) invested less than 5% of its $4.8 billion budget in lung cancer research in 2007. The two other federal agencies with significant cancer research programs – Centers for Disease Control and Prevention (CDC) and the Department of Defense (DOD) – have no money earmarked for lung cancer in 2007. Expressed in dollars per death, research funding through these three federal sources in 2007 totaled $23,754 for breast cancer, $11,959 for prostate cancer and $5,500 for colon cancer. Lung cancer research spending was $1,414 per death, a 23% drop from $1,829 in research funding per death in 2005. $246 Billion will be paid to the 50 States (and the District of Columbia) over the next 25 years by the Master Settlement Agreement. Of this $246 Billion, no funds are dedicated to Lung Cancer Research, and just 0.65% is earmarked for federal research into tobacco use and other substance abuse. The nation's governors unanimously passed a resolution in 1999 stating that they "are committed to spending a significant portion of the tobacco settlement funds on smoking cessation programs, health care, education, and programs benefiting children." Tobacco Prevention Programs were to be funded by each state at levels suggested by the U.S. Centers for Disease Control and Prevention (CDC). Yet in 2004 states were spending just 3% of their tobacco settlement money on tobacco prevention, and an audit of 2003 spending revealed that only 4 states have funded tobacco prevention programs at the CDC-recommended guidelines. 46 states have allocated the majority of their tobacco settlement monies to balance budgets and fund projects, including the development of roads, bridges and prisons. Cancer Facts & Figures 2008, American Cancer Society. NCI Financial Management Branch, National Cancer Institute.